I never wanted to design my own web site. I write and edit hypertext fiction for a living, I code HTML at work, I see at least fifty web sites a day, and certainly have the storage space available to put up a site, (there is free web hosting everywhere, it seems). Even with all the resources and tools available to me, the desire was not there. Instead of the usual, "I don't know where to start" attitude that keeps one from beginning a project, I didn't know why to start. 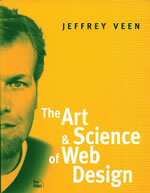 I read three chapters of Jeffrey Veen's book, The Art & Science of Web Design, and the next day I was coding my own site. The book is about the "why?" of Web design. While there are examples of HTML code and technical explanations, more of the book is concerned with how a person reads a Web page, and how a Web designer can improve the reader's experience. The book is less a manual than it is an inspirational text. Veen is equally energetic whether he's tracing the history of HTML, the Web, and Web design, or explaining how the <font size> tag works in different browsers. "Good design comes from not only knowing your subject matter, but from an intimate knowledge of your audience. As it turns out, the same is true for good advertising . On the Web, then, targeted advertising and targeted user interfaces are the same thing. And the same profiling strategies can apply to both. But to fully exploit either, we'll need to think about Web design in a much more dynamic way. Until then, we're stuck with ugly advertisements that don't work on sites desperate for traffic. Please, enough of the shotgun approach. Market to me!" As I gradually build my site, this book is staying next to my computer. I'm glad to have the help.